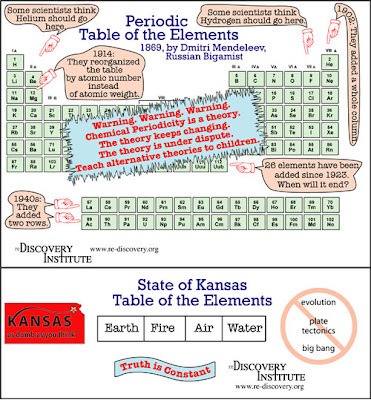 This Kansan version of the periodic table from the re-Discovery Institute says it all. It's called 'flyover country' for a reason. Last year I took a ton of photos at my town's 'nation's oldest' 4th of July parade (on steroids). This year? Not so much. In addition to the tuckered out revolutionary above I didn't get too much. Just this outstanding tricycle with speakers, and remarkably unnecessary open tent exit sign. The parade was pretty standard but included a few oddities. Usually all the major office-holders march together in the parade, but this year we had the Governor, Senators, one Congressman, and then about 15 minutes later the other one, Congressman Patches, all by himself. Without a beanie, he just looks wrong. But my favorite was a float where they seemed to have soldiers dressed in the uniforms of different eras, WWII, WWI, Civil War, Revolutionary, and then, inexplicably thrown in there, a pirate. Amusement parks are great places to take pictures. There is gaudy, interesting signage everywhere, and brightly colored inhuman machines full of screaming children. Unfortunately, since I was with somebody and spent most of my time there in various lines, I wasn't able to wander the place aimlessly looking for things to photograph. A dramatically positioned, rickety roller-coaster. What is that? Some kind of industrial hydraulic pump? No! It is part of a gigantic flyswatter! The sun setting somewhere in relation to this roller-coaster. This chip clip has an optimist bit of profoundity. Apparently, IT'S A GREAT TIME TO BE ALIVE™. I don't know whether this comes from the cardiovascular therapy company or the financial company, and I don't want to. All I want to know is what makes this plastic trinket so happy about our present era. Not that I disagree, despite the more stylish architecture and fancier clothing of past decades, I certainly appreciate the technology, science, and antibiotics of the early 21st century. In fact, the mere existence of chip clips connotes a certain amount of progress in taking care of life's more essential demands. What about the future though? Does this clip have some kind of prophetic ability? Is it implying that civilization is soon to collapse? What does the chip clip know that we don't? More importantly, how would a non-living object know how great it is to be alive, at this or any other time? The Providence Journal has an article about the current brainiac of the Sox farm system. Despite the reporter being impressed by his use of his word 'elucidate' it is fairly encouraging. 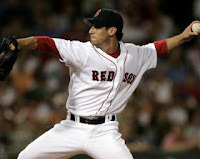 Craig Breslow is a Yale Biophysics and Biochem major currently titrating* himself up the pitching ranks. What say we talk about what pitches you throw. So far this season, Breslow’s array of pitches has been almost as baffling to batters as molecular biophysics. Going into last night’s game, the 26-year-old lefty had an earned-run average of 1.59 in 25 relief appearances covering 39 2/3 innings. He had given up just 30 hits while striking out 48 and walking only 9. He had a record of 1-1, with one save, and hitters were batting a mere .208 against him. And if he doesn’t, he can put that Yale degree in molecular biophysics and biochemistry to good use. Wow! That's my plan too. Hey Red Sox organization, I'll be a few miles from Pawtucket next year, and I've got at least a foot on Pedroia! *This is definitely the wrong use of this word, but we don't have to know about such things in cosmology. I've been traveling all over the place. Baseball games, parades, amusement parks. Not a lot of time or fodder for blogging. I will give you this however -- a video of some kids igniting 10,000 match heads in a bucket. The result? Mushroom cloud.